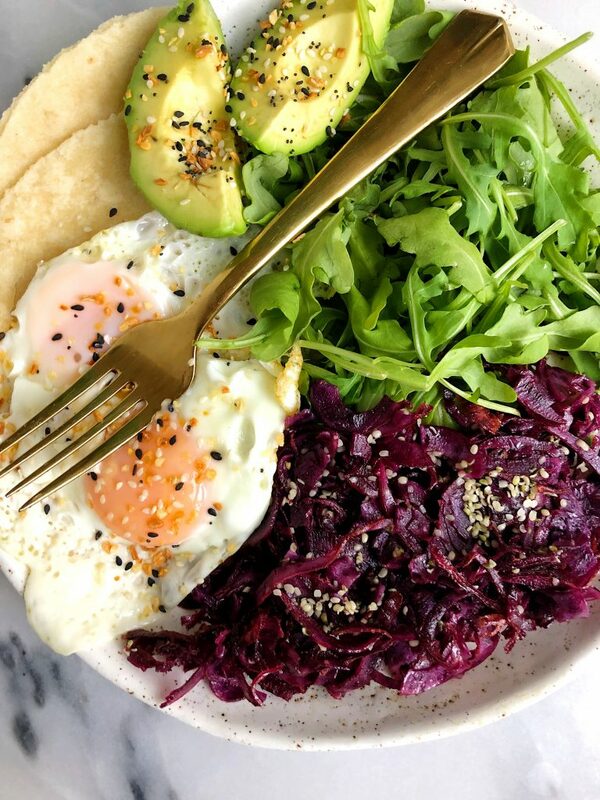 5-minute Savory Breakfast Plate filled with healthy fats, protein and extra greens for a quick and easy meal for anytime of the day! Allow me to interrupt your holiday baking sessions to give a little something simple and savory and not cookie related. 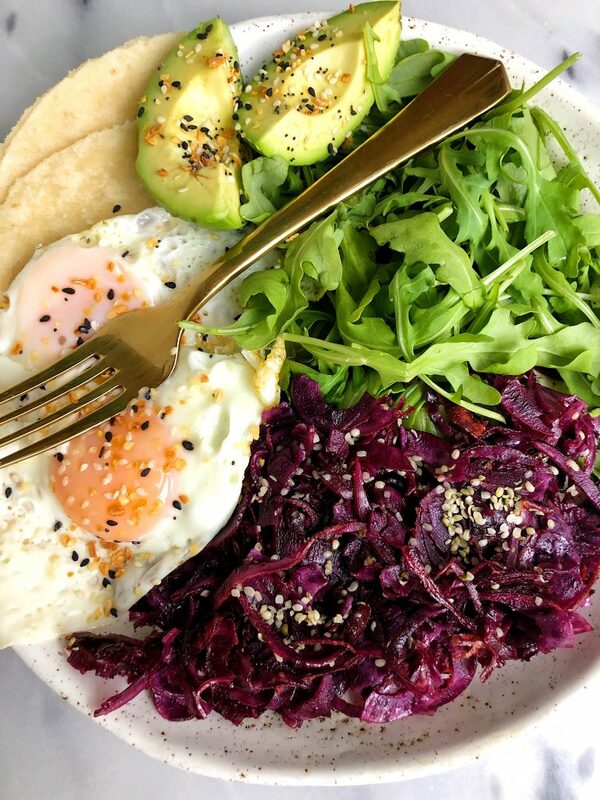 My go-to 5-minute Savory Breakfast Plate is here. You guys have been requesting a quick and easy savory breakfast plate for months now and today, it is finally happening! I’m the type of eater who will gladly feast on breakfast food anytime of the day. Breakfast, lunch or dinner – eggs sound good to me. Especially for dinner these days when I am waddling around not wanting really to make a whole production in the kitchen. This plate takes me a few minutes to prepare and it is always just the right amount of food to satisfy me until dessert. 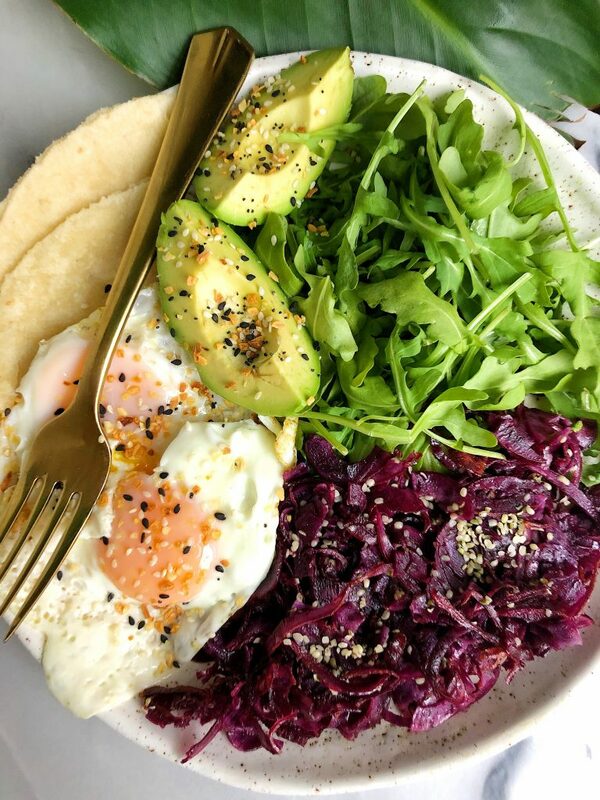 What I love about this breakfast plate is how versatile it is. I love switching up the veggies I make with it by using what I have on hand (usually it’s a potato of sorts because – potatoes, duh). There are always pasture-raised eggs involved in some way whether they’re scrambled, made into an omelette or fried (but extra well done for preggo reasons) like today. Then I always toss in some organic leafy greens. Something we always have enough of in the fridge because Organic Girl makes every type of organic green that is triple washed and ready-to-eat (my kind of greens). Usually I am craving some baby arugula and spinach of sorts or a mixture of a few different greens. Anything you are craving works perfectly. I like to pair this with some warmed up tortillas, toast or even crackers for that bread-y craving I get when I make eats. Anything works with this dish friends, so make it work for you! In case you are doing some other cooking and have some leftover Organic Girl greens, here are a few of my other go-to recipes on the blog: Healthy Baked Mac & Cheese, 10-minute Green Falafels and Whole30 Loaded Veggie Burgers. Remove from heat and add to a plate with greens, sweet potato, avocado and warmed tortillas! Thank you Organic Girl for sponsoring this post. It means so much to me to partner with brands I love and believe in!